Comments: This album contains one gem after another. Orla Fallon has been a favorite of mine since I had seen her on the Celtic Woman PBS concert that has now gone global in it's broadcast. Orla is a very talented vocalist as well as harpist and the combination is very enchanting. I love listening to this album on the drive home from work and at any time I just need to soothe the soul. My favorites from this album include "The Water is Wide", "Carrickfergus", and "Gartan Mothers Lullaby"
Write about Celtic Woman Presents: The Water Is Wide! 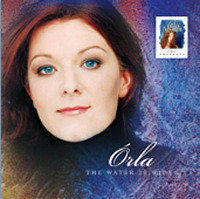 Want to write a review about Orla Fallon's Celtic Woman Presents: The Water Is Wide album? Post your comments in this box to be displayed in our community forums and in our album database! Please make sure you are logged in before proceeding. Please login to write your comments about Celtic Woman Presents: The Water Is Wide.